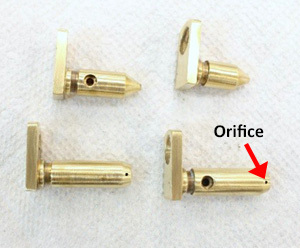 This is the Second in a five part series of tips and suggestions for replacing bearing in a precision CNC spindle. This series is specifically for the DIY person with limited resources. It is not a comprehensive description of how a fully equipped shop that specialized in spindle repair works. While we will reference certain specific spindle makes it is primarily intended to be rather generic. If you have a specific question please send an email at info@highspeedtechnologies.com or call 1-603-483-0333. Last week we considered some tips on getting your spindle apart. Now we will need to get and install the correct bearings. So this week we’ll speak about Angular Contact Bearings, lubrication and how to preload them. Next week we’ll discuss Cylindrical Roller Bearings. When we’re speaking about bearings on a CNC spindle we’re speaking about two different types, Angular Contact and Cylindrical Roller Bearings (CRB). In a few instances there may be deep groove type bearing and an occasional cup and cone. Their installation is usually straight forward and they are not going to be discussed in this article. Angular Contact Bearings (ACB) can handle axial and radial loads and are considered thrust bearings. However, they can only handle axial loading in one direction; so they are always used in pairs. Roller bearings have tremendous radial capacity; but zero axial capacity. So if your spindle uses a CRB it will also have at least one pair of ACBs. Because we warranty all of our work HST only uses top name brand bearings purchased from authorized distributors. We simply can’t take the chance that an inferior bearing will fail prematurely. These bearings have one thing in common; they are expensive. However, the DIY guy may want to take a chance and use some “off brand” bearings. Depending on the spindle, the price difference could be over a thousand dollars. If you have a problem locating a bearing give us a call. 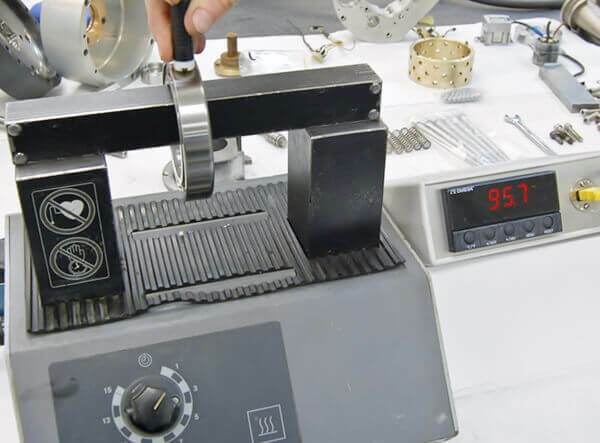 We may be able to help you find a source and assist with spindle bearings installation. High performance CNC spindles use Super Precision ABEC 7, ABEC 9 or P4 spindle bearings. For a long time these were purchased as a matched set. We always prefer matched sets. However, today matched sets are becoming more difficult to find and there is an industry movement toward P4 singles. The theory is that any P4 bearing will be within the tolerance specification for matched set. As noted these Angular Contact Bearings (ACBs) can only resist axial loads in one direction. For this reason they must be used in multiple bearing arrangements to handle thrust loads in both directions. These bearings come configured in a number of different arrangements. To get started let’s take a look at an angular contact bearing. This is a typical angular contact bearing configuration. In this example the angular contact surface is only on the outer race. Some series have the angular surface on the inner race and some have it on both races such as ball screw support bearings which have their own set of considerations. The first thing to know is that ACBs have a front and a back. It is import to be able to identify which side is which. Most often bearing nomenclature is printed on the back of the bearing. But that is not always the case so it is good to be able to identify which side is which by looking at the bearing. If a bearing is installed backwards the spindle will not perform satisfactorily and the bearing is likely to be ruined. Note in the diagram that the bearing can resist thrust on the shaft pushing from front to back. If any significant thrust is applied back to front the bearing can separate and be ruined. It is easy to see why when you look at the cross section. Whenever possible replace the bearings with the exact same parameters. But sometimes the bearing will not have a complete set of numbers stamped on it. Fortunately many things can be determined by just looking at the bearing. For instance are the balls ceramic or steel, is it sealed or open and so on. If it’s impossible to get the complete bearing information we recommend certain “default” selections for ACBs. Cage: If available specify either a phenolic resin or a polyamide cage. If it is a roller bearing a machined brass cage may be the only option. Seals: If it is an open bearing and only sealed bearings are available you can pop the seals out. 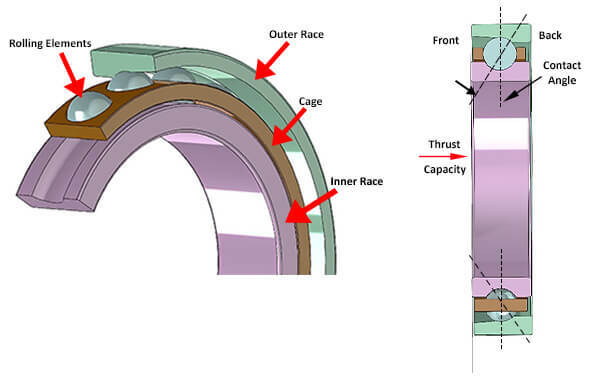 This race only calls out the bearing series and the contact angle. All of the other information except the preload can be derived from examining the bearing. When you receive the new bearings treat them with care. They are very susceptible to damage resulting from small impacts. Do not accept bearings if the box is damaged which may indicate that they were dropped. At HST we only purchase top name brand bearings. Our preferred bearing is NSK. Some other brands that we will use include, Barden, FAG, NTN, GMN, SNFA, and a few others. Over the years we have learned that certain brands are better for a particular application. And because of our experience there are some leading name brands that we shy away from. No matter what brand you chose be cautious of counterfeit bearings. During installation take care to avoid transferring installation forces through the rolling elements. For example do not install bearing onto a shaft by pushing on the outer race. And conversely do not install bearings into a housing by pushing on the inner race. Excessive force on static rolling elements against a race results in Brinelling. Also, we often use thermal differential to fit bearings. This includes heating and cooling shaft and housings so bearings install easier. At HST we expand the bearing races using an induction heater to permit easy installation on a shaft. You may try a heat gun. Watch you temperatures. We use a heat gun to expand the housing when we install a preassembled bearing stack. An induction heater is the best way to expand bearing inner races for seating onto the shaft. Carefully monitor the temperature. We don’t normally exceed 130oF. The first thing we do is look at the box and verify that we have the correct bearing. 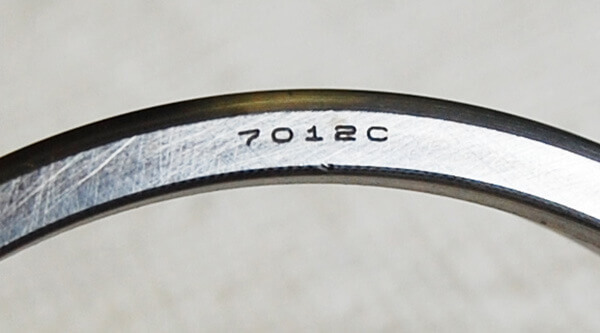 You can go to the manufacturer’s on-line catalog to get the full interpretation of the nomenclature; in the example below we have a nominal 70mm ID and a 110 mm OD. Besides providing the complete part number, there is some important information concerning the dimensional deviation of the enclosed bearing. The label provides the exact deviation from nominal. This example tells us that our ID is 5µm under nominal and the OD is 3µm under nominal. This deviation needs to be considered when fitting the bearing to the shaft or housing. For example if your configuration required a shaft interference fit of 5-7µm, the minus 5 µm is part of that. So now the shaft only has to be 0-2µm over nominal. Similarly if you want a housing fit of plus 5 to 8 µm for a sliding spring pack the minus 3 µm is part of that. Many DIY repairs will not need to take this information into account. But it’s there if you need it. Unless you are using sealed bearing we recommend careful and thorough cleaning before installation. After cleaning dry them off with clean dry compressed air. If you do not have a good compressed air system, get a can of compressed air such as is used to clean computers. Right after cleaning, the bearings should be properly lubricated. Our FAQs have a more in depth discussion on lubrication. Air/oil jets must be perfectly clean and carefully reinstalled. If your spindle is oil mist lubricated, a clean film of the appropriate oil is all that is needed before installation. We do not recommend using grease on an oil lubricated bearing. Change all of the lubrication lines when replacing the bearings. Also, take time to clean the jets and replace all of the O-rings. The jets have minute orifices; make sure these are clear. Just a little contamination can result in premature failure. As mentioned in the previous blog each jet has a specific location and should be installed in the exact same port that it came out of. Extra care is needed for grease lubricated spindles. Our first warning is use a high quality ultra-filtered grease. For most spindles we use Klüber NBU15 or the Barden equivalent. Our second warning is do not over pack the bearing. Too much grease will cause overheating and premature failure. For ACBs the grease fill is 15% of the open area and 10% for roller bearings. Precision bearing manufacturers publish charts with the exact amount of grease that should be used in any particular bearing. Most bearing manufacturers publish this data on line. At HST we have an automated precision lubricating system in its own filtered air flow bench. (We grease a lot of bearings.) But you can go down to the local drug store or pet supply store and pick up a couple of graduated syringes. And Barden sells convenient ultra-filtered Klüber NBU 15 prepackaged in a 30 cc calibrated syringe. How much grease should a spindle bearing get? Bearing manufacturers publish charts with that data. At HST we have an automated lubrication system. You can purchase graduated syringes at the local pet supply store. After cleaning and lubricating, the bearings must be kept clean. You can keep them in a new Glad Freezer bag until you’re ready to install them. Use a syringe to meter the proper amount of grease lubricant. Do not over lubricate. Please send us your comments, suggestions our questions.